Google’s flagship video service YouTube pulled in $9bn in revenue last year, according to an analyst with in-depth knowledge of the service’s finances. Ken Sena, an analyst at investment bank Evercore ISI, estimates that the platform will have paid out around $5bn in the year to content creators/rights-holders – at YouTube/Alphabet’s standard 45%/55% ad revenue split. Sena’s estimates appear to be backed up by another leading analyst, Jack Hough, writing in Barron’s – who claims that YouTube is worth twice as much as Netflix, at around $100 billion. 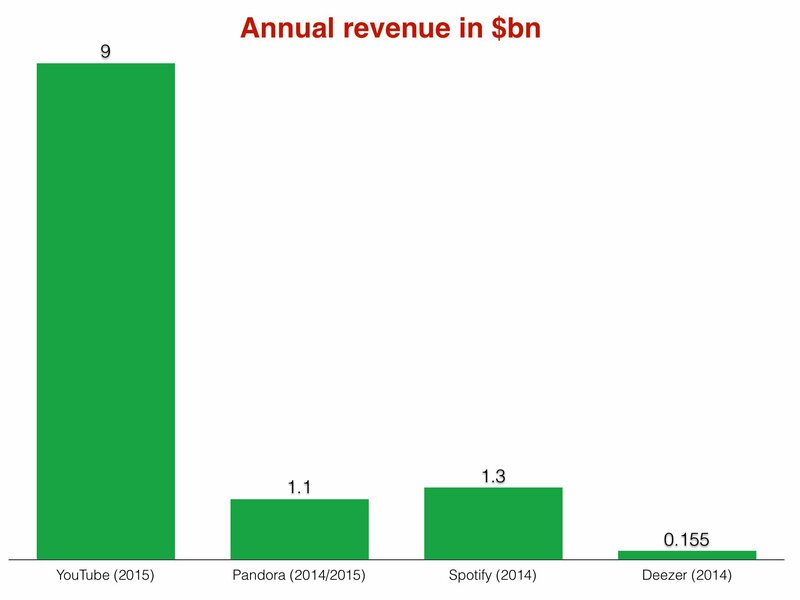 So if YouTube did generate $9bn in 2015, how did that stack up next to other players in the music streaming space? Obviously, this is a slanted comparison: YouTube’s money was generated by all sorts of videos, while the likes of Spotify, Pandora and Deezer are – by and large – fully reliant on music to attract consumers. In addition, although we have up-to-date figures for publicly-traded Pandora – for the last four quarters to end of September 2015 – the latest known fiscal results for the other two services date back to 2014, when Spotify in particular had significantly less subscribers/users than it does today. Clearly, the difference is palpable. But all four services have at least one thing in common: none of them, if reports are to be believed about YouTube, actually turn a profit. Meanwhile, ComScore concluded a few years back that 40% of YouTube’s audience clicked over to watch music videos. In fact, Vevo accounted for 38% of YouTube’s entire monthly viewers, while Warner Music – which remains independent of Vevo – accounted for 20%. Also, don’t forget this graph. 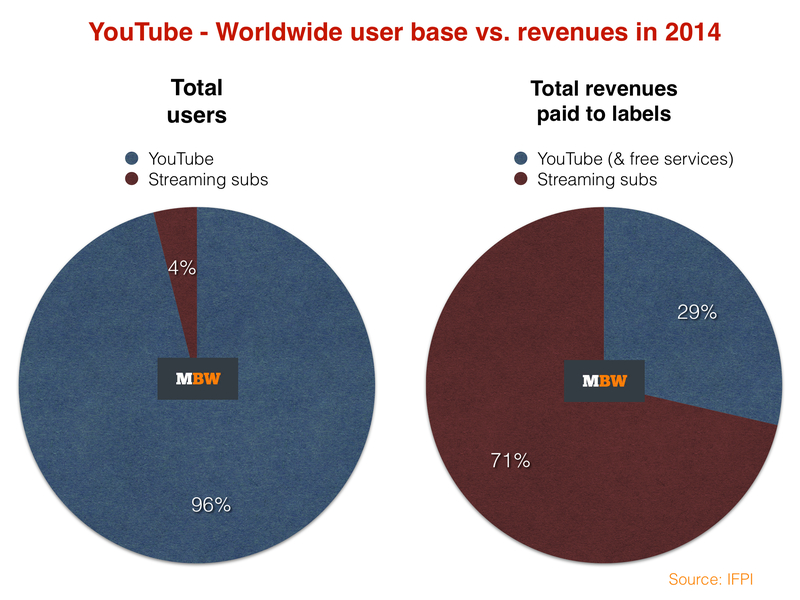 Never forget this graph: YouTube’s total users (1bn +) vs. all of the subscription streaming users in existence in 2014 (41m).